An inspiring, critical and practical look at what we can learn from ancient wisdom. Do you consider yourself stoical? Do a bit of meditation or mindfulness practice? Buddhism and Stoicism have a lot to offer modern readers seeking the good life, but they're also radical systems that ask much of their followers. 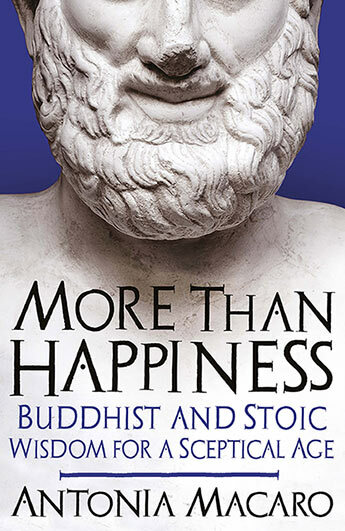 In More than Happiness, Antonia Macaro delves into both philosophies, focusing on the elements that fit with our sceptical age, and those which have the potential to make the biggest impact on how we live. From accepting that some things are beyond our control, to monitoring our emotions for unhealthy reactions, to shedding attachment to material things, there is much, she argues, that we can take and much that we'd do better to leave behind. In this synthesis of ancient wisdom, Macaro reframes the 'good life', and gets us to see the world as it really is and to question the value of the things we desire. The goal is more than happiness: living ethically and placing value on the right things in life. Antonia Macaro is an existential psychotherapist, co-author of The Shrink and the Sage, and author of Reason, Virtue and Psychotherapy. She has many years' clinical experience in the field of addictive behaviours. Antonia has a degree in Oriental Studies and an MA in Philosophy, and was part of the UK's philosophical counselling movement from its early days.